It's Thursday night, and the party houses, restaurants and bars along Main Street in Buffalo's University Heights come alive with college students who have returned for a new school year. On this night, cops patrol on bikes. Security cameras watch from high above on light poles. Both are new, after several high-profile crimes -- including a May murder on Main Street -- raised a sense of fear on these streets surrounding the University at Buffalo's South Campus. The students -- and their parents -- have a right to be concerned. While the University Heights has traditionally been one of the city's safest neighborhoods, it has experienced a rise in crimes over the past five years that are more violent and more personal, a Buffalo News analysis found. Just look at Minnesota and Lisbon avenues, the two residential streets with the most crime in this neighborhood. At the same time, crime citywide hasn't increased nearly as much. For some crimes, city streets have become safer. The difference, some believe, stems from the large number of college students living off campus in this northeastern corner of Buffalo, home to 16,000 residents, about 20 percent of them UB students. The University Heights crime database contains information on more than 9,000 incidents reported to Buffalo police from 2004 to 2008. Type in an address or street name. Or select the type of crime you would like to search for. The cheap rent, the nightlife and the proximity to campus outweigh safety concerns. "It's a lot of fun," said Alyssa Fronk, a UB student who lives on Englewood Avenue. "All of our friends live down here." For years, homeowners complained about the college students' drunkenness and the foolishness that can spill over during all hours of the night. The same careless, carefree attitudes also make the students easy prey. "There's no question about it," said Capt. David Stabler of the Northeast District, which includes the University Heights. "You have a lot of young kids targeting these students, because they're easy, they give it up and they can't describe [their assailants]." "Where else but the University Heights are you going to find a house full of 18-year-old guys with a new stereo system, who leave their door open and are passed out drunk?" said Fronk's roommate, Ashlee Hoover. Over the years, longtime neighbors watched with concern as University Heights started to shrink. In the past five years, nearly 500 UB students have left the neighborhood, many of them opting instead to move to the newer, higher-end private apartments near the North Campus in Amherst. The longtime residents are worried about crime on the rise and low-income families moving in. "We tend to think of the East Side creeping north, and that's what we're trying to prevent," said David J. Ellerbrock, president of the University Heights Collaborative. Officials from UB and the city point to the cameras along Main Street, the bike-patrol detail, and more-aggressive efforts to thwart rowdy parties as solutions. "It's not a panacea," said Vincent D. Clark, director of community relations for UB, "but the university is committed to doing what it can do right now." Some residents question how much UB is doing to protect the neighborhood that borders its South Campus … and whether that's enough. When Javon R. Jackson was shot dead after a dispute in a Main Street restaurant on his graduation day from UB in May, University Heights became rather deserted, with many people taken aback by the early-morning murder. "Students are more cautious, because that never happened here," said Nelsys Aybar, a UB junior who lives in the Heights. "That was like a wake-up call." The News looked at University Heights crime incidents reported to the Buffalo Police Department from 2004 to 2008, the most recent year for which data was available. Assaults, burglaries and robberies are up significantly. Burglaries were up by one-third from five years ago. Assaults … down citywide … were at a five-year high in the University Heights in 2008, with an average of two a week. It's unclear how much of that may be caused by fights among students, such as last year's brutal beating on Main Street that left a UB student paralyzed. Particularly troublesome were the robberies, which nearly doubled over five years. The 151 robberies last year were fueled by a string of armed holdups in the spring and fall. Police arrested several teenagers for the crimes. Crime escalates as students return for the fall. While crime citywide peaks in July and August, crime in the University Heights is highest in September and October. The homicide rate is no higher in the University Heights than it is throughout the city. An average of two murders a year occur in this part of town. Main Street, the commercial heart of the neighborhood, not surprisingly accounts for the most crime, including larcenies, robberies and assaults. But among residential streets, Minnesota and Lisbon each had more reported robberies, burglaries and assaults than any other. Crime varies widely within the University Heights. Dissected by Main Street and Bailey Avenue, the boundaries of the University Heights … as defined by UB … are Kenmore Avenue to the north; East Amherst to the south; Eggert Road to the east; and an old railroad right of way to the west. Fearing crime, some students have moved away from the Bailey area over the years, longtime residents say. But the crime rate between Bailey and Eggert is actually lower than it is citywide. The most troubled area of University Heights lies between Main and Bailey, which includes parts of Minnesota and Lisbon. Neighbors say this area, once heavily populated by students, now is the home for more low-income families. Some say that juxtaposition of poverty and the affluence of students is driving up crime in the area. College students, many from Long Island and Westchester County, bring with them more expensive electronics than ever before. Gadgets like laptops and iPods are small, easy to carry … and all too often, easy to take. Many students also tend to be naive and somewhat careless. They often leave their doors unlocked, or even slightly open. They don't bother to use security systems. And they think nothing of walking alone at night, often tuned in to the music on their iPod, rather than any danger that might be lurking behind them. "I tell mothers, I can put 10 locks on the door, but I can't make them lock them," said Nancy Miranda, who has been renting apartments to students in the Heights for 32 years. The triangular-shaped area west of Main … which is becoming known as the party capital of University Heights … had the lowest overall crime rate. But the crime, including assaults, robberies and burglaries, is increasing faster in this area than elsewhere in the neighborhood. Hoover, a UB junior, should know. Her house was broken into and her laptop was stolen from her room. Corey Medina knows, too. A couple of old chairs were stolen from his porch since moving onto Englewood in June. "If you're smart, don't call attention to yourself, keep your doors locked, I don't think you're going to have a problem," said Medina, a UB junior. Many longtime residents say the university seems more concerned about the Heights in the past few years. They generally seem to appreciate the security cameras the university has paid to install in the neighborhood. It's a step in the right direction, many say. One of the cameras was instrumental in catching the person accused of killing Jackson in May. Buffalo police also designated a patrol car specifically for University Heights last year and are deploying additional cars in the area for the first few weeks of the semester. The new bike detail … using UB, Buffalo and Niagara Frontier Transportation Authority officers to patrol on peak party nights through September … seemed to go over well the first night. "I think it's wonderful," said John Bernard, owner of Third Base, a Main Street bar. Still, more needs to be done, residents say. "[The cameras] can deter some crime, but nothing deters crime like a police cruiser driving down the street," said Tucker Curtin, owner of the Steer and Lake Effect Diner on Main Street. Residents would like to see UB's 61-member police force patrolling the University Heights. "We don't patrol off campus. Us going into Buffalo would be the same as Buffalo [police] going into Amherst or Cheektowaga," said UB Police Chief Gerald W. Schoenle Jr, whose force is about the size of the West Seneca Police Department. "Buffalo police would tell you it's their responsibility to patrol the Heights, and we agree with that." University police can patrol on campus, along with other property that UB owns. So while UB officers are seen near the president's home on LeBrun Road in Amherst, a mile and a half from campus, they respond in University Heights when Buffalo police ask them for help. UB patrolling in Buffalo would be almost like having a regional police force, Schoenle said. It also could pose union issues for Buffalo police. "If we had our officers always responding to things off campus, they wouldn't be available for things on campus," Schoenle said. "We'd like to see a greater willingness of the SUNY police to get involved," said Ellerbrock, the neighborhood activist. These problems aren't unique to UB. UB officials say they are looking at ways other universities … like Ohio State in Columbus and the University of Pennsylvania in Philadelphia … helped stabilize the neighborhoods around their campuses. "We're not going anywhere," said UB's Clark, who lives in the University Heights. "We will invest in our South Campus, and we're looking to be even more aggressive in the neighborhood." 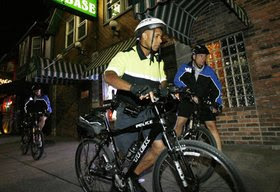 But for now, UB said it's doing what it can … like the bike patrols. On the first night of the patrols, Buffalo police officer Antione cqLanier, along with UB officers Scott Bixby and Lt. Chris Bartolomei, biked along Main, between the campus and LaSalle avenue. They stopped to talk to bar and restaurant owners, and warned them police don't want to see patrons drinking on sidewalks. "The idea is to be visible and hopefully a deterrent," Bartolomei said. "Maybe we'll be able to roll up on something in progress."